More than half of Sonoma County's 53 miles of coastline is dedicated to public use, but it's often more scenic than recreational. Anywhere along the Sonoma coast, sleeper waves can appear unexpectedly, washing unsuspecting visitors into the water. Turbulent, cold water makes even such simple activities as surf play or climbing the rock outcroppings dangerous. If you want to know about the water quality at any of the beaches in Sonoma County, you can check it at the Department of Health Services website. Gerstle Cove, Salt Point State Park: Gerstle Cove has great tide pools and offshore rock formations. It also has excellent examples of a geologic formation called "tafoni." Look for sandstone rocks with a honeycomb-like rock pattern full of pits, knobs, ribs, and ridges, near the ocean's edge. Sandstone was quarried nearby to build San Francisco's streets and buildings in the mid-1800s. Look closely and you may see eye bolts used to anchor ships while sandstone slabs were loaded onboard. Quarried rocks can still be seen scattered north of Gerstle Cove with drill holes along the edges that were used to help break larger rocks into smaller slabs. Salt Point State Park: Salt Point is a spectacular park, with all kinds of terrain: grasslands, forests, prairies, pygmy forests, rocky promontories, quiet coves and pounding surf. It was also one of California's first underwater parks where marine life is completely protected. Divers come to the cove to explore the wonders of the undersea world. You can also hunt abalone when it's in season if you can free dive down to 30 or 40 feet. Near the shore, the cove is shallow, making it a fun spot for new divers to explore. You'll be able to see lots of marine life: anemones, crabs, sea stars, palm and feather boa kelp. Besides diving, Salt Point is a good place for photography, tidepooling and fishing. Goat Rock Beach: Goat Rock Beach sits at the mouth of the Russian River near Jenner. It is known for its scenic views. It's got all the great features photographers want, with the river pouring into the ocean, waves crashing against the offshore "sea stacks." In spring, you'll find wildflowers in the dunes, too. That makes it one of the most photogenic beaches on the Sonoma Coast. Harbor seals and their babies lounge on Goat Rock beach from March through August. You might need a telephoto lens to get great photos of them, though. For their protection, you should stay at least 50 yards away, especially during pupping season. Also to protect the seals, dogs are not allowed on Goat Beach. You'll find picnic tables and restrooms nearby. North Salmon Creek: North Salmon Creek is a pretty, curving beach anytime. In the winter, it's the most popular skimboarding spot in Sonoma County. If you're not familiar with the activity, skimboarding is done on a smaller version of a surfboard. Riders use it to glide out across the water's surface to meet an incoming wave, then ride it back to shore. North Salmon's shorebreak is said to be one of the heaviest along the coast, which is what makes it so popular with skimboarders. Doran Regional Park: Situated between the Bodega Harbor and the ocean, Doran Beach is a two-mile-long stretch of sand. It's a good place for family picnics, sand castle-building or kite-flying. It's also a nice spot for a stroll on the beach. The calmer water on the harbor side is one of the safer places for swimming. The rock jetty near harbor mouth is a good spot for fishing or crabbing. There's an accessible boardwalk with viewing areas and beach wheelchairs are available upon request. 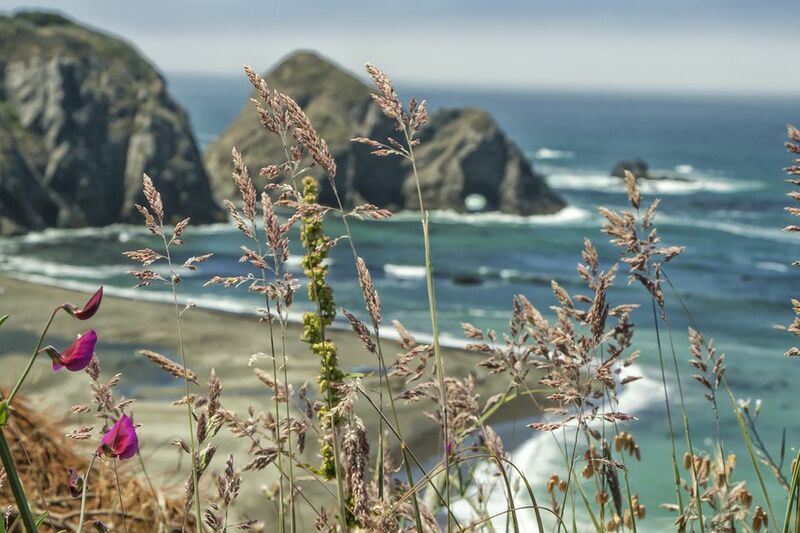 Places to camp at any Northern California beach are scarce, but you can find a few in Sonoma County - and elsewhere along the coast in this Guide to Beach Camping in Northern California.